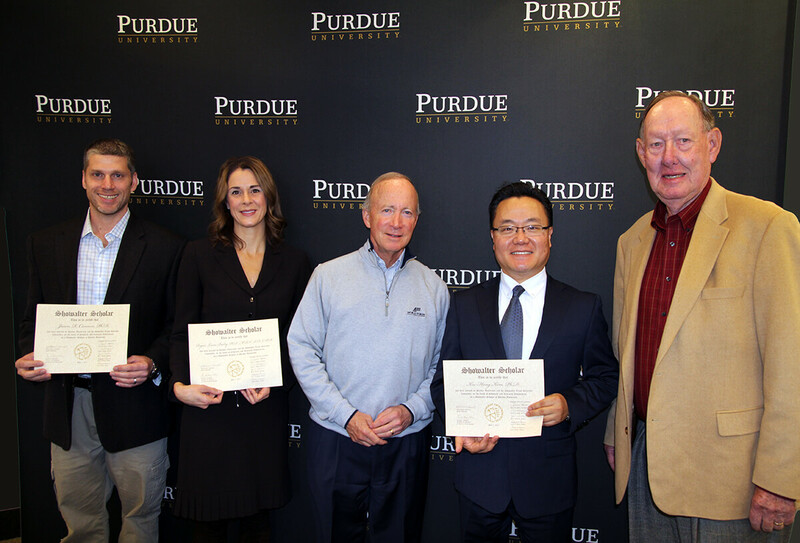 Showalter Scholars Jason Cannon, Regan Bailey and Kee-Hong Kim pose with Purdue President Mitch Daniels and Dr. Robert Holden, member of the Showalter Trust Selection Committee. Photo by Sarah Anderson. See story below. Kathleen Abrahamson, an associate professor in the School of Nursing, has been awarded a Hulman Health Achievement Award in the Health Science and Research category. She was honored by the Indiana Public Health Association at the Indiana History Center in Indianapolis in October. Abrahamson received the Excellence in Public Health Science Research award, which recognizes those who conduct impactful, innovative research that focuses on disease prevention, health promotion and population health outcomes. Rakesh Agrawal, Winthrop E. Stone Distinguished Professor of Chemical Engineering, and Gintaras Reklaitis, the Burton and Kathryn Gedge Distinguished Professor of Chemical Engineering, received awards for outstanding research and education at the 2017 American Institute of Chemical Engineers (AIChE) Annual Meeting in Minneapolis, Minnesota in October. Agrawal received the Alpha Chi Sigma Award for Chemical Engineering Research for outstanding accomplishments in fundamental or applied chemical engineering research. Reklaitis received the Warren K. Lewis Award for Chemical Engineering Education for distinguished contributions to chemical engineering education. Three Purdue University professors have been awarded the distinction of fellow from the American Association for the Advancement of Science, the world’s largest general scientific society. The professors are being honored for their efforts toward advancing science applications that are deemed scientifically or socially distinguished. Sylvie M. Brouder is a professor of agronomy, the Wickersham Chair of Excellence in Agricultural Research and an Extension educator on plant nutrition, nutrient management and cropping systems. Thomas Hertel is a distinguished professor of agricultural economics, the founder and executive director of the Global Trade Analysis Project (GTAP) and a fellow and past president of the Agricultural and Applied Economics Association. Zhong-Yin Zhang is head of the Department of Medicinal Chemistry and Molecular Pharmacology, a professor of chemistry, distinguished professor of medicinal chemistry, and the Robert C. and Charlotte P. Anderson Chair in Pharmacology. Sarah Calve, an assistant professor in the Weldon School of Biomedical Engineering, has become the first Purdue faculty member to receive the National Institutes of Health Director’s New Innovator Award. She is only one of 55 recipients this year for the annual NIH award, which was first established in 2007. Calve’s research offers potential future applications in the regeneration of diseased or damaged tissue by looking at the separate formation and then seamless connection of muscle to tendon to bone. Hal Kirkwood, associate professor and business information specialist in the Roland G. Parrish Library of Management and Economics, was elected president of the Special Libraries Association. Kirkwood will serve as president-elect in 2018, president in 2019, and past president in 2020. Kirkwood joined the Special Libraries Association in 1992 and has previously served on the board of directors from 2012-14, president of the Indiana chapter and chair of the Business and Finance Division. Seungjin Kim, the Capt. James F. McCarthy Jr. & Cheryl E. McCarthy Head of the School of Nuclear Engineering, has been elected to American Nuclear Society Fellow Grade, the highest membership grade of the ANS. The society has a membership of around 11,000 professionals. The Universidad Nacional de San Agustin (UNSA) has recognized Daniel Leon-Salas, associate professor of engineering technology in Purdue Polytechnic’s School of Engineering Technology, for his contribution to the development of knowledge and serving as a “distinguished example” of UNSA’s graduates. In collaboration with a colleague at the University of Kansas, Ben Mason, assistant professor of special education, has been awarded a $2.4 million Stepping Up Technology Implementation grant from the Office of Special Education Programs (OSEP) in the U.S. Department of Education. The grant will fund the scale-up of I-Connect, a technology-enabled, self-monitoring intervention with school-based mentor supports designed to help at-risk secondary students meet academic and behavioral expectations. A team led by Jonathan Poggie, an associate professor of aeronautics and astronautics, was selected for the competitive Frontier Award of supercomputer hours from the U.S. Department of Defense. The award enables science and technology research that would not be possible without extraordinary computer resources. The awarded hours are typically utilized in very large projects which use up to 100 percent of the processors on a supercomputer and produce many terabytes of data. Susan Sangha, assistant professor of psychological sciences, has been elected to a four-year term on the Executive Committee of the Pavlovian Society,which is dedicated to the integrative, interdisciplinary scientific study of behavior. The Society promotes both basic and applied research in learning and behavioral neuroscience. W. Andy Tao, a biochemistry professor in the College of Agriculture who discovered a method to detect and monitor breast cancer using a simple blood test and bladder cancer using a urine test, is the 2017 recipient of the Outstanding Commercialization Award for Purdue University faculty. Chenn Zhou, director of the Center for Innovation through Visualization and Simulation at Purdue University Northwest, has been nominated for the highest Fellow award of the 2017-18 class of the Society of Innovators of Northwest Indiana. The Gerald I. Lamkin Fellow for Innovation and Service award honors visionaries and innovators who practice extraordinary service to the community, region and world. The Society of Innovators was established by Ivy Tech Community College in 2005. Eight professors have received Kinley Awards for 2017. They are Azza H. Ahmed, School of Nursing; Blake Allan, Department of Educational Studies; Jean Beaman, Department of Sociology, College of Liberal Arts; Blake L. Jones, Department of Human Development and Family Studies; Zhao Ma, Department of Forestry and Natural Resources; James A. McCann, Department of Political Science; Mandy Rispoli, Department of Educational Studies; and James M. Tyler, Department of Psychological Sciences. Eleven faculty members have received Showalter Trust funding for 2017. They are Birgit Cabot, Department of Animal Sciences; Gaurav Chopra, Department of Chemistry; Alexander Chubykin, Department of Biological Sciences; Nana Gletsu-Miller, Department of Nutrition Science; Jeremy Lohman, Department of Biochemistry; Jianguo Mei, Department of Chemistry; Sujith Puthiyaveetil, Department of Biochemistry; Bruno Tesini Roseguini, Department of Health and Kinesiology; Jonathan Shannahan, Department of Health Sciences; Darci J. Trader, Department of Medicinal Chemistry and Molecular Pharmacology; and Qi Zhou, Department of Industrial and Physical Pharmacy. Three additional faculty members have been designated Showalter Faculty Scholars for 2017: Regan Bailey, Department of Nutrition Science; Jason Cannon, School of Health Sciences; and Kee-Hong Kim, Department of Food Science. Read more.